Everest Three Pass Trek or 3 passes Treks lies in Khumbu Region of Nepal with the alpine pastures and Lakes of Gokyo or Milk Lake the abode of Lord Shiva. It is a challenging trek taking in three spectacular high passes in one of the most scenically stunning areas. This is the ultimate high-altitude trek, in the world’s most spectacular mountain terrain. It’s undoubtedly tough – but the scenery provides more than ample rewards. Think of this not just as a trek but more as one of the finest mountain journeys you are ever likely to undertake in your lifetime. It is justifiably popular, but takes you over three little-trekked passes – the Renjo La (5,345m), Cho-la (5,330m) and the Kongma La (5,535m), and through the remote Bhote Khosi valley. It provides fantastic views of well-known 7,000 and 8,000m peaks. We have the superb classic objectives of ascending the summits of Kala Pattar for unrivalled views of Mount Everest, and Gokyo Ri, offering panoramic views of Cho Oyo, Mount Everest, Cholatse and many more Himalayan giants. We also cross the challenging and often snow-covered Cho La pass, which links these valleys. While you are in this trek, you can see the outstanding and majestic views of Mt. Everest, Cho-Oyu, Lhotse, Nuptse, Pumori, Amadablam, Lobuche and other many more mountains from Kalapathar and Gokyo-Ri top. . From this point we take the trail to Lobuche, crossing Cho La pass (5,330 m) and join the small village of Dzongla. After the ascent of Kalapatthar (5,545 m) and the impressive up-close view of Everest, our return route passes through Kongma La (5,535 m) or the Imja Tse valley. While going down, we stop in Tengboche, a magnificent location with a fascinating monastery. We rest here and savor the incredible scenery, including magnificent views of Everest, Ama Dablam (6,856m), Kantega (6,809m), Kwangde (6.194m), Nuptse (7,879m) and Lhotse (8,511m), to name but a few. Day 01: Arrival at Kathmandu (1300m). Arrive at Kathmandu where we are met and transferred to our hotel. In the evening we will conduct a briefing session. SWAYAMBHUNATH STUPA also known as the monkey temple, is climbed by a long set of steps and has great views of Kathmandu. Your day begins early as you head for Kathmandu airport to catch to Lukla flight. Assuming the flight departs without much delay, you will have fine weather with stunning views of Himalayan peaks. The trail leaves Lukla through a Kani or gateway. Soon you are walking down gently descending trails, past rolling farmlands that extends over what seems to be a wide promontory overlooking the canyon of the Dudh Koshi River. The snow peak at the head of the valley is Kumbila (5,716m), the mountain sacred to the Sherpas. On the way to Phakding, you will notice a huge boulder printed with Tibetan religious mantras (mostly; Om Mani Padme Hum). About 3 hours walk, you will be in Phakding. Day 04: PHAKDING – NAMCHE BAZAAR (3450m, 5hrs). We continue north following the Dudh Koshi river and on to Jorsale where we enter the Sagarmatha (Everest) National Park. From here it is a short walk to the confluence of two rivers, the lmja Drangpa (Imja Khola) and the Nangpo Tsangpo (Bhote Koshi) followed by a steep climb (for about 2hrs.) to Namche Bazaar, the main town in the Khumbu region. Namche is a prosperous Sherpa town and an important trading center with a weekly Saturday market. Distance: 10.5km/6.5miles approximately 5 hours walks. Day 05: Acclimatization day in NAMCHE. This is your day for acclimatization and rest. Acclimatizing here is particularly important for the onward trek, when you begin gaining altitude quickly. This day is meant for acclimatization and hence we do not embark on any serious trekking. Instead we go to a slightly lower altitude of Thame, the birthplace of Tenzing Norgay, the first man on Everest. We conduct some sightseeing of the monastery there and generally rest. Day 08: LUNGDEN – RENJO-LA PASS (5,340m). Trek to GOKYO LAKE (4750m). The big day starts real early and it is a long day, as we have to walk about 5 hours to reach the pass, going slow because of the high altitude. After a brief stopover to enjoy the stunning beauty of the Everest Range and take photographs, we start on a remarkably difficult downhill journey for about 3 hours to reach the village of Gokyo walk along the stunning and beautiful Dudh Kunda (Milk Lake). Day 09: Hike to GOKYO RI (5483m). After two to three hours "huff and puff" you reach the summit not to be disappointed for your effort at all, as the views from here are well worth the effort you put in. Everest (8,848m), showing more of its northern flank than from Kalapathar, with Makalu (8,481m) further to the east and Cho Oyu (8,201m) towards the north make a mesmerizing view to watch. Return back to Gokyo Ri after spending a wonderful break at the summit. Today, we are on the trail to Thaknak. Thaknak is also sometimes pronounced as Dragnag. We climb out of Gokyo village to a ridge. Then, we take the route through the Ngozumpa Glacier to the mountain on the other side. Continuing further and traversing along the edge of that mountain, we descend down to Thaknak. On the trek, we enjoy the magnificent views of Cho Oyu, Gokyo Ri, and other high Himalayas. Today, we trek to the Cho La Pass. Cho La pass is also another show up of this trip. Today is going to be one of the toughest days. The pass is not itself difficult but it is steep and involves a glacier traverse on the eastern side. We need to be careful as the trail is vertical and the rocks glazed by ice add trouble to the trekkers making the trail slippery. Our trail climbs through a ravine and a rocky trail. So, we climb up continuously up from Phedi. We trek through the side of a frozen lake while we come to the top of the pass decorated with prayer flags. We need to pass through some crevasses before we reach Dzongla, another beautiful place with a complete view of Mt. Cholatse, Mt. Ama Dablam, Lobuche peak and the Pheriche village far below. After a breakfast at Dzongla, we head to Gorakshep. It is easy downhill for a while and few up and down till Lobuche. Onwards, the trail is though rocky trail with a great view of Mt. Everest, Mt. Nuptse, Mt. Pumori and many more. The interesting part of this today is you are walking by the moraine of Khumbu icefall till Gorakshep. We start early in the morning to catch the dramatic views from Kalapathar witnessing the first light of day shining on Mt. Everest. Familiar the most famous peaks such as Lingtren, Khumbutse, Changtse to the east and Mt. Everest between the west shoulder crest and Nuptse. After 2 hours of ascent, we will be Kalppathar. 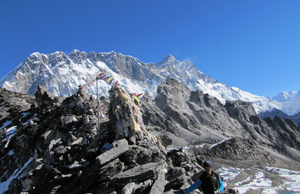 From this juncture, we scramble to climb the rocky outcrop near to the summit marked by cairns and prayer flags. As we reach the top, we sit on the Kalapathar where our eyes rook taking in the unbelievable Himalayan Panorama, wandering from one mighty massif to another. After a light lunch we will set off to walk to Everest Base Camp which is approximately 4 to 5 hour return trek back to Gorakshep. After crossing the sandy flat at Gorakshep the trail climbs onto the lateral moraine of the Khumbu glacier and ascends the side of the glacier for two hours before finally descending onto rocky glacial moraine. The trail then winds up and down and through fascinating ice sera’s to Everest Base Camp where there are fantastic close up views of the Khumbu ice fall. After a short stop we will retrace our trail back to Gorakshep. On being back to Gorakshep and continue to walk to Lobuche of 2 hours walking. Chhukung is also the starting point for the Island Peak Climbing. Now we are getting closer to the Himalayan civilization of the Khumbu Region. The Imja Khola joins the Dudh Koshi River a little above the Pangboche Village. There is a famous monastery at Pangboche believed to have been the oldest in the Khumbu region. From Pangboche, we descend down the alpine desert and back into greenery of pine forests. The path leads to a steep uphill climb into Tengboche. We pay our visit to the famous Tengboche Monastery. The trail descends steeply downward so we need to walk slowly and under control as our shaky legs continuously battle the rocky terrain. After crossing the suspension bridges over the fast flowing Dudh Koshi River and its tributaries the trail becomes more level and natural. Upon arrival in Lukla, we stretch those sore legs and recall the experiences of the last couple of weeks. We experience the culmination of a fantastic trek on a happy note with everyone back safe and sound with smile on faces. The early morning flight drops us at Kathmandu. We can take a rest and relax throughout the day at our hotel. Above mentioned Trip cost are the fixed cost for Autumn for Everest Three Passes Trek 2019. The cost mentioned in the tables are the cost from 4 to 10 peoples in a group. The date for the trekking flexible upon your request. A group booking of 10 or more people is subjected to a maximum discount with the availability of free trip to one person. If your group is much larger please contact us to discuss about the price. One day full sightseeing in Kathmandu including all entrance and monument fees. Food and standard accommodation on lodge that included room, breakfast, lunch and dinner. Expenses of personal nature such as aerated drinks, beverage, laundry, postage, telephone etc.